Nouris a freelance photographer & film maker. She has turned her passion into a living. 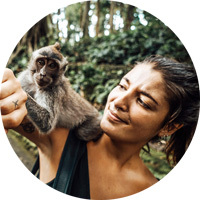 In 2017 she became a “digital nomad” and traveled through the world while working. A few months ago she has launched her successful websitewith an integrated shop of her photos. Nour is an artist, a frequent traveler, a film maker and a recurrent Dojo member. In her article she tells about her challenges and her latest project.